That title is almost true. There are times that I root for the Cardinals. For example when they are playing the Brewers. 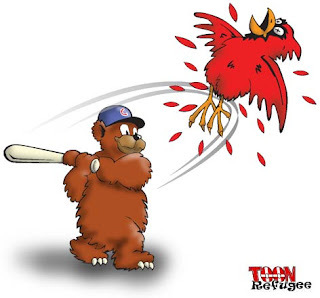 After a much needed day off today, the Cubs begin a simple series with the Cardinals. I call it simple because we seem to be running on 10 of the 12 cylinders that we have in the engine. Yea that's right I just said we have a V12 engine. I am not one to worry about global warming...well atleast I am not going to stop driving my V12s. September: 9 of 25 at home games, 21 of 25 against the NL Central and 12 of 25 against the Brew/Cards. That makes the month of August very important. Not only is it my birthday but it is also a month to pull away and to create a great cushion between us and the Brew/Cards.